Shetland Islands capturing the wild beauty of this remote part of Scotland. Buttercup (2/2), Daffodil (2/3), Lagoon (1/1), Sorbet (1/1) any of the other 174 DK colours we stock can be substituted. and Sheep Heid hat patterns (available through Ravelry). Jamieson's - The Original Shetland Wool! 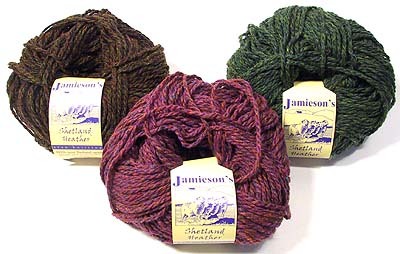 Camilla Valley Farm is pleased to offer Jamieson's 100% pure Shetland wool yarn spun in the company's own mill in the Shetland Islands north of the Scottish mainland for over a century. 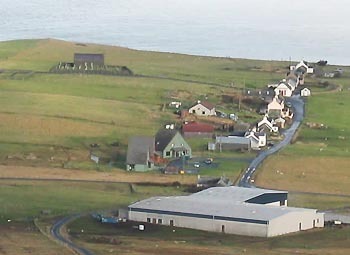 In a world where large corporations produce many products we buy, we are proud to support this small company, owned and operated in the Shetland Islands, that continues to produce the best Shetland Wool knitting yarn while promoting the work of the local sheep farmers and employing local Shetland Islanders to turn fleece into yarn! The fleece of the native Shetland Sheep used in Jamieson's wool has a soft resilient texture which has developed over the centuries to protect them from the extreme weather conditions of their northern home. Jamieson's Shetland Wool is renowned by knitters world-wide for its unique texture. This real Shetland Wool is produced from Shetland Sheep living on the Shetland Islands and spun in a Shetland Islands Mill by Shetland Islanders! We current stock (see below) all colours of the 2-ply Spindrift, Double Knitting, Heather Aran (previously called Soft Shetland) and Lace Ultra colours. Jamieson's yarn is available in individually or in yarn packs for any of the designs in the Jamieson's growing collection of pattern books. 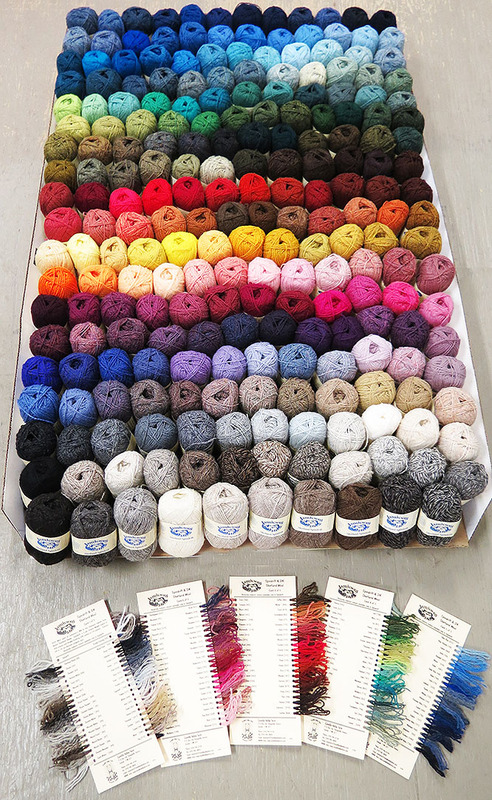 We also have Shade Cards and Yarn Designer Kits that include a ball of every colour at a special discounted price! 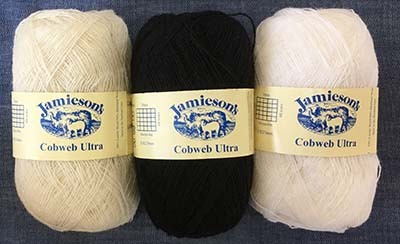 Note: There is some confusion between the Jamieson's wool that we sell and yarn from the younger company Jamieson & Smith, a division of the Curtis Wool Direct corporation that spins their wool in England for retail and industrial markets. We do not sell this yarn, but we do provide a handy colour conversion chart for similar yarn weights to allow knitters to substitute Jamieson's yarn in Jamieson & Smith patterns. Four generations have worked with wool in the business which is now Jamieson's Spinning in Sandness, a small and very remote community on the far Westside of Shetland. The business was started in the 1890's by Robert Jamieson, who brought knitwear spun and knitted by crofters, from their own wool. His son, Andrew, continued this tradition, but change always comes, and he had to start looking for yarn for his knitters, as hand-spinning steadily declined. This meant buying wool, and sending it to the mainland of Scotland to be spun. Frustratingly, when the Shetland wool reached the spinners, technology and experience was such that it was blended with coarser clips from bigger sheep, to make spinning easier. A pretty good yarn was the result, but one which was never quite good enough, and many of the unique qualities of pure Shetland wool were missing. 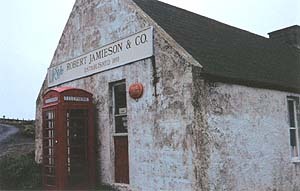 Bertie, the grandson of the founder, developed the business a degree further, setting up a retail shop in Lerwick, Shetland's capital and only town, and going on 40 miles from Sandness. That shop sold, and still sells gansies, happs, scarves, gloves and all the other garments which Shetland women have produced with their hands and on their machines over the years. Through this time, the dream of creating a garment from nothing but the pure Shetland wool clip lived on in the family. The dream started to come true over a hundred years later, in 1980, with a small, experimental spinning mill where they set out to spin pure Shetland wool, unblended with any other. Jamieson's now produce enough to satisfy customers who want to knit with the genuine article, and to make a considerable quantity of beautiful Shetland Tweed fabric as well. 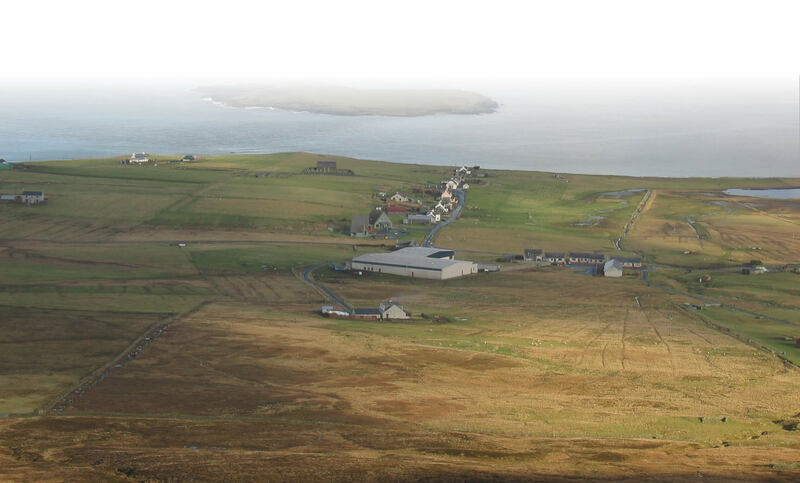 If you travel as far west as you can on the Shetland mainland, you will eventually come to the small town of Sandness where Jamieson's of Shetland operates the only commercial Spinning Mill in the Shetland Islands. Click here to see the full view! This modern facility framed by breathtaking ocean views is owned and operated by the Jamieson family where they produce the world's finest 100% Shetland Wool yarn. Built in 1981, this mill combines all the stages of yarn production under one roof. In this facility, Shetland Wool from the native Shetland sheep on the islands is grading and scoured, dyed, colour blended, carded, spun, twisted and balled turning the wool into the 100's of gorgeous colours of Jamieson's Shetland yarn prized by hand knitters around the world. Click Here to see the mill in action! 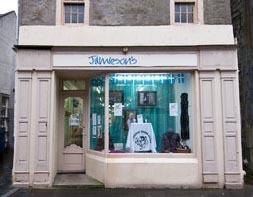 The company also operates a retail store selling yarn and knitwear in Lerwick, the capital and largest city in the Islands. With their unique ability to manage the complete journey from fleece to knitting yarn in one location, Peter Jamieson and his family are able to produce yarn with a range of colours and level of quality unmatched in the market today! 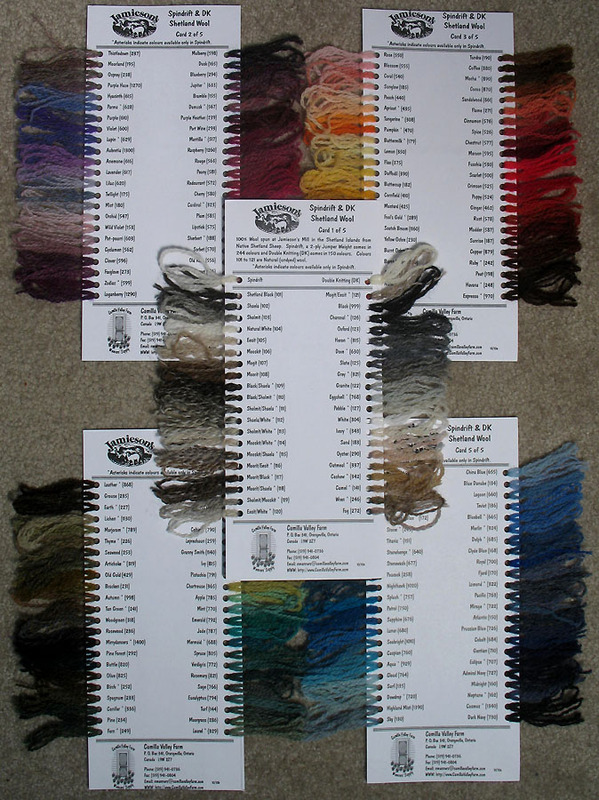 Follow the links above for more information on each yarn type as well as colour charts for each. Click Here for a collection of Jamieson's patterns and yarn kits. This is a 2-ply Jumper weight Shetland Wool Yarn in 225 beautiful shades. Made from 100% natural wool grown and spun in the Shetland Islands, it knits up 30-33 stitches/32-35 rows equaling 4 inches (10 cm) using 3.0 mm (US Size 2-3) needles. Yarn is packaged in 25 gram balls with approx 115 yards (105 metres) of yarn in each. Jamieson's Spindrift 2-ply yarn is an excellent substitute for the discontinued Scottish Campion yarn that Jamieson's produced for the Alice Starmore pattern books. For more information and for a colour substitution chart Click Here. We have also provided a substitution chart for Jamieson & Smith Jumper Weight yarn. See all 225 shades on our Spindrift Colour Chart. We also have Shade Cards and a Designer Yarn Kit that include a ball of each colour at a special discounted price. This is a Double Knitting (DK) weight Shetland Wool Yarn in 174 beautiful shades. This marvelous 100% natural wool grown and spun in the Shetland Islands knits up 24 stitches/32 rows equaling 4 inches (10 cm) using 3.75mm (US Size 5) needles. Yarn is packaged in 25 gram balls with approx 82 yards (75 metres) of yarn in each. Note:Jamieson's DK yarn used to be packaged in 2 ounce (56.7 gram) skeins which held 170 yards (155.4 metres). All books except Simply Shetland specify the quantity of yarn required using this package size so a conversion is required. Please contact us for help with this if required. See all 174 shades on our DK Colour Chart. We also have Shade Cards and a Yarn Designer Kit that include a ball of each colour at a special discounted price. This is a Aran weight Shetland Wool Yarn in 46 beautiful shades. This marvelous 100% natural wool product grown and spun in the Shetland Islands knits up 16-22 stitches/20-24 rows equaling 4 inches (10 cm) using 4.0 to 5.0 mm (US Size 6-8) needles. Yarn is packaged in 50 gram balls with approx 101 yards (92 metres) of yarn in each. Jamieson's Heather Aran yarn is an excellent substitute for the discontinued Scottish Heather yarn that Jamieson's produced for the Alice Starmore pattern books. For more information and for a colour substitution chart Click Here. 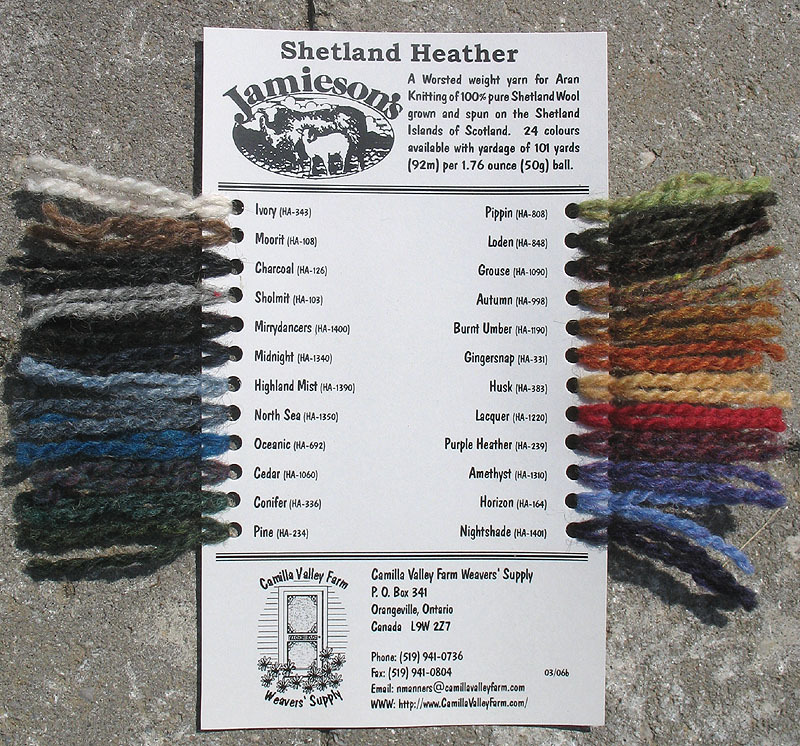 Note:Jamieson's Aran weight yarn used to be called Soft Shetland and was packaged in 56.7 gram (2 ounce) skeins. Heather Aran in a new set of colours replaced this in late 2005 and can be used for all Soft Shetland designs. Please contact us for help in determining yarn quantities and substituting colours. See all 44 shades on our Heather Aran Colour Chart. We also have Shade Cards available for ordering. This is a Lace weight yarn blended from 50% Shetland Wool and 50% Geelong Lambswool that comes in 23 beautiful shades. This 100% natural wool product knits up 25 stitches/30 rows equaling 4 inches (10 cm) using 3.25 mm (US Size 3) needles. Yarn is packaged in 25 gram balls with approx 194 yards (177 metres) of yarn in each. See all 38 shades on our Ultra Lace Colour Chart. This is a Cobweb Lace weight 1-ply yarn is a single ply blended from 50% Shetland Wool and 50% Geelong Lambswool that comes in 3 beautiful shades. Perfect for "Wedding Ring" type shawls, this 100% natural wool product knits up 25 stitches/30 rows equaling 4 inches (10 cm) using 3.25 mm (US Size 3) needles. Yarn is packaged in 25 gram balls with approx 425 yards (390 metres) of yarn in each. 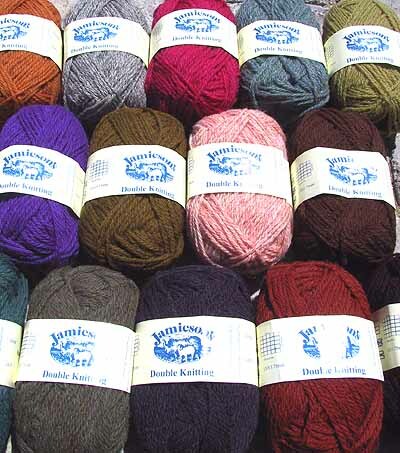 The Jamieson's palette is the richest colour collection of wool yarn available today. With 225 colours of Spindrift, 174 colours of DK (Double Knitting) and 46 colours of Shetland Heather (Aran) currently available, being able to combine, compare and sample using any combination of shades makes the process more rewarding for the knitwear designer. The ability to quickly see how colours work together and to substitute others to determine the effect is key to the beautiful Fair-Isle designs produced in this wool. We currently have a number of different shade card sets to allow the designer to mix and match colours. Our Spindrift/DK card set is 5 cards that includes all the current shades of these two yarns arranged by colour. 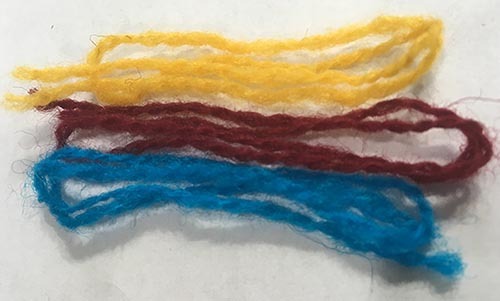 We include approximately 12 inches of Spindrift yarn for each colour which is removable to allow colours to be put side by side while choosing colours. For example, click here to see how easy it is to determine if "Maroon", "Splash" and "Cornfield" go together! 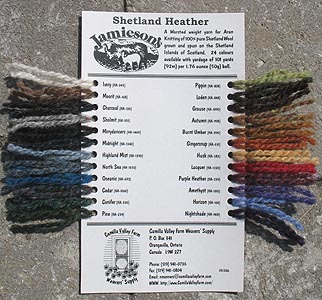 We also have a separate Shetland Heather card with a 6 inch sample of each of the colours (Click on the pictures to the right to enlarge). NEW! We have also created "electronic shade cards"
with these colours for the iPhone, iPad and iPod Touch. 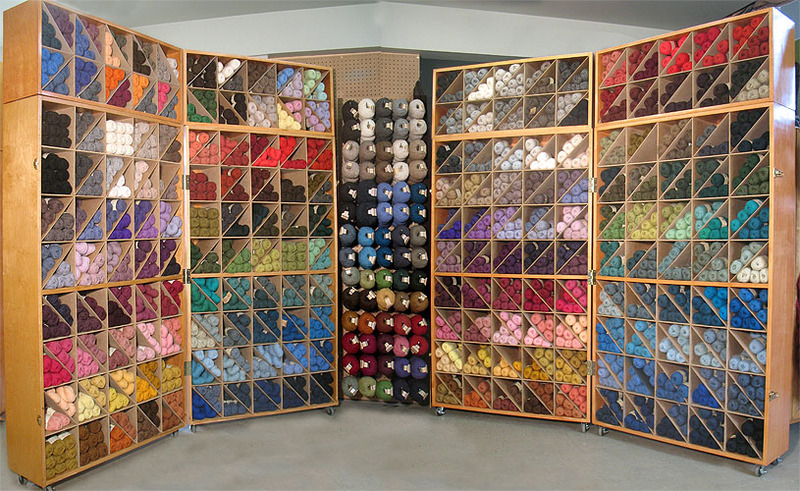 Try out our free Yarn Shop App! free shipping to Canada or sites in the Continental US. For those knitters who wish to be able to swatch with colour combinations, we have put together Yarn Designer Kits that include a complete set of full balls of Spindrift or DK yarn, one for each of the current colours. There are currently 225 colours in the Spindrift kit (pictured right) and 174 in the DK kit. Note that we include every colour and not just a subset of shades like other kits and includes full balls of each colour and not mini-skeins or samples! To make these more affordable, the kits are priced at a significant discount off the list price of this yarn and we also include a set of Spindrift/DK yarn cards which is a $30 value! Some of our customers split the cost among a group of knitters and then get together and divide it up among themselves! the Spindrift kit can be used for colour design for both yarn types. We have a collection of Jamieson's Pattern books in stock. 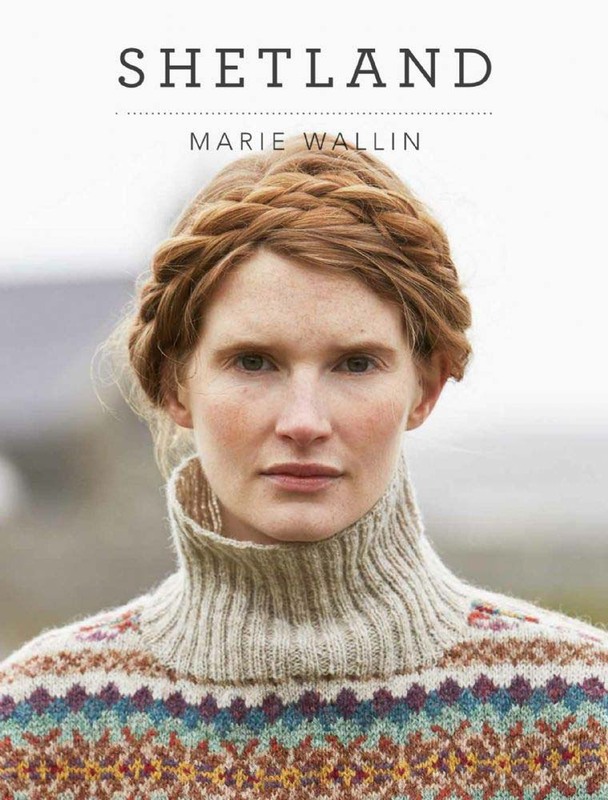 Each includes a mixture of about 20 age-old, traditional Shetland knitting side-by-side with highly contemporary knitting projects. Full knitting instuctions are provided for each garment along with full colour photos of the finished works modelled against wonderful scenery. Each book also includes some extra bonus articles on interesting background information! 16 Designs using Jamieson's & Simply Shetland Wool Blends 21 Designs using Jamieson's & Simply Shetland Wool Blends 18 Jamieson's Designs for Adults and Children 24 More Beautiful Designs in Shetland Wool 21 Pullovers, Hats, Scarves, Vests and More! 15 Felted Handbag Designs 21 Jamieson's Designs for Adults and Children 20 Jamieson's Designs for Everyone! 16 Jamieson's Designs for Adults and Children 10 Design's using Jamieson's DK! Unlike many stores, Camilla Valley Farm is a stocking dealer which means that we carry inventory of all colours of Jamieson's yarn in all weights and do not simply order it when a customer places an order with us. As well as faster delivery, this also means that customers visiting our store can make their selections while comparing the colours of the actual yarn. We normally maintain more than 8,000 balls in inventory, some of which is pictured below.